This paper introduces system dynamics modeling to understand, visualize and explore technology integration in schools, through the development of a theoretical model of technology-related change in teachers’ practice. Technology integration is a dynamic social practice, within the social system of education. It is difficult, if not nearly impossible, for the human mind to fully conceptualize complex social systems. Therefore, it is necessary to use conceptual frameworks designed to examine these phenomena. 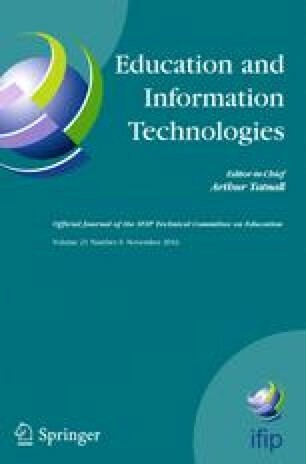 The model presented in this paper draws together known factors of integration and findings from a large-scale technology initiative in Australia to create a preliminary casual-loop model of technology integration in secondary school teaching. The preliminary model illustrates feedback and multiple effects in the system of education. The use of system models can potentially support a shift from focusing on teachers’ technology use to student outcomes, and the feedback loop of students’ technology use on teachers’ practice. Implications for technology integration, teacher change and learning are discussed. Alessi, S. (2000). The application of system dynamics in elementary and secondary school curricular. Retrieved from http://www.c5.cl/ieinvestiga/actas/ribie2000/charlas/alessi.htm. Ossimitz, G. (1997). The development of systems thinking skills using system dynamics modeling tools. Klagenfurt. Retrieved from http://wwwu.uni-klu.ac.at/gossimit/sdyn/gdm_eng.htm.